Jamie McLellan has found his place – in the most literal sense. His dream location for work was “being as close as possible to sea level”. 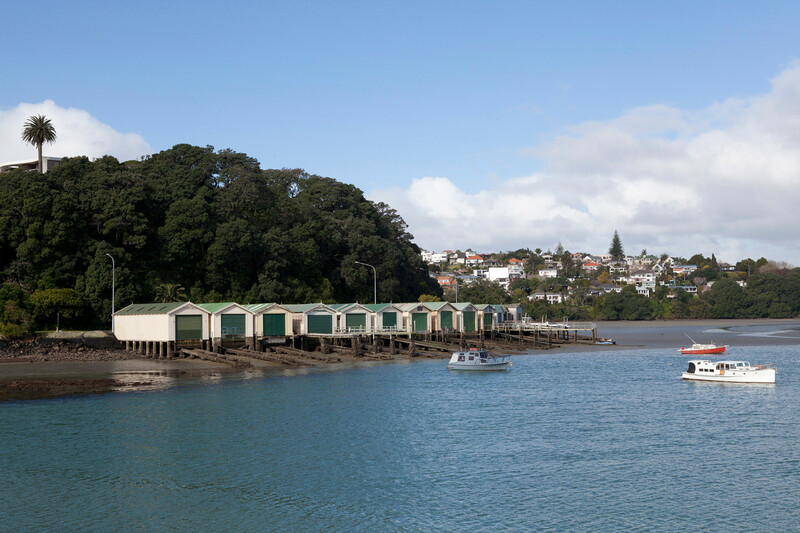 Now, he works out of a converted boatshed, just minutes away from downtown Auckland. One side of the shed is a floor-to-ceiling window that induces an outdoor feel throughout the office. After many years as an expat in London, Milan and Hong Kong, Jamie returned to his homeland with a wealth of professional experience. He now runs a small, but burgeoning studio that designs an extraordinarily wide range of objects: from coat stands to kayaks and from furniture to footwear. When you see this shed from the outside, you don’t expect a design studio inside. How did you come to set up your office in here? Gidon Bing, a friend and amazing sculptor works out of the shed next door and he is the reason for us being here. I had often mentioned to Gidon that it would be my dream to work out of a boatshed like his. On the same day as we were given our formal notice from the previous office, Gidon emailed to say his neighbors had put a ‘For Rent’ sign up on their shed. Yep! We immediately went to see the owners… and with the help of a bottle of good rosé we managed to secure the shed that was obviously meant to be ours! Your office has a very outdoor feel. How important is it for you to be close to nature? I have found that I need to be as close as possible to sea level as often as possible. Before moving into the boatshed my routine was to ride my bicycle to work via the waterfront, stopping off along the way to sit by the water and quietly plan my day. When I travel, or if in the past I was too busy to do this, I would always feel a little out of sorts. There is something special about the salt air, it calms me and resets my senses in preparation for the day ahead. Do you also draw inspiration from nature for your designs? Sometimes, but more often I find inspiration in engineering, which itself, I guess, is governed by nature. The most nature inspired piece I have designed would be my coat stand. Like a branch, or a twig, its hooks reduce in thickness towards the end. Do you have any favorite materials to work with? I try not to have favorite materials, because otherwise I can get lazy, falling back on the same processes instead of pushing myself to explore and learn more. I try to steer clear of plastics and injection moulding whenever possible. I much prefer the idea of using materials that in their past life have been carbon sinks, and that once used, I know in their place will be planted another carbon sink. You studied design at the Wellington School of Design and then you’ve traveled around the world for work. What are some of your most rewarding and memorable professional experiences abroad? Working in Milan taught me that good things take time, that the idea of a young pop star designer was naive and counterproductive. Then working in China I suddenly understood the scale of Western consumption. When I worked in London for Tom Dixon it was the post-graduate that I never studied. In the early days of the studio, when Tom was transitioning from Habitat to Artek and his own brand, he was incredibly busy. This gave me a huge amount of freedom and more responsibility for projects than I would have thought I was capable of. I grew an enormous amount in the process. Tom Dixon used to be a bit of a mentor for you, right? Are there any other designers that had a big influence on you? Tom is the most generous, cheekiest and most visionary designer I have ever met. But I have also been inspired by the late Achille Castiglione, Barber & Osgerby and the Bouroullecs. All of these designers form the benchmark for me to measure myself against and to aspire to. How has it been moving from a large design company to running your own business? At first it took a bit of getting used to. When I came back to New Zealand all the work I was doing was still for people overseas, including continuing to consult back to Tom Dixon. This meant lots of late night Skyping and weekends working. I was eight years younger and had the energy to just grind away. Looking back I pulled some really long hours. But this really set me up. I read somewhere an interview with the Bouroullecs where they said they don’t work weekends. I have since followed their lead. Now I have a much better balance. I still work hard during the week, but recharge on the weekends. For recharging on weekends, I guess Quick Nik helps. I saw that’s the name of your boat outside! Yes, the boat helps a lot! I got her when I turned 30 and she was pretty shabby, but over the years I’ve worked to tidy her up. Ever since I was a teenager I’ve wanted one of these boats – a Farr 727. The hull has such beautiful lines, I always feel like I’m staring at an Eames fibreglass chair when she’s out of the water. Do you manage to take her out regularly? In the summer I take her out on the water every second weekend island hopping. The great thing about living in Auckland is having the Hauraki Gulf as a playground. What the city might lack in cosmopolitan conveniences – although this is fast changing – it makes up for in stunning getaways within as little as two to three hours sailing. Did you ever think of designing your own boat? I think about it a lot! Within the next five years I’d like to be sailing my own design. I’d love it to look like the kayak Andy and I designed. Even better would be if it we could explore the use of alternative composite materials – flax fibres and non-petrochemical resins. And it seems you’re also into windsurfing? I sold my racing dinghy when I was at university and bought a second hand windsurfer from my uncle Mike. Wellington is the windiest city on the planet so it was quite intense learning to windsurf there, yet completely addictive. I had never experienced such speed and control on a sailing vessel. To this day, windsurfing feels like the perfect interaction between human, the elements, and a piece of equipment. The only other thing that comes close to this, for me at least, is riding a bicycle. Was it nature and water sports that drew you back to Auckland? Well, when I lived abroad it always felt like such a treat to come home. I would yearn to come home, saving all my money and leave allowance to return. Eventually I realized there was nothing stopping me from coming home full-time. How do you view the design scene in New Zealand? Whilst it is a small community, it is an incredibly healthy one – per capita it’s actually very large come to think of it. There are people doing amazing work and yet, perhaps through necessity, everybody has their own niche, nobody is stepping on anyone else’s toes. It doesn’t feel like a design ‘rat-race’ down here. Is there such a thing as typical “New Zealand design”? Yes: Possum traps! I love the work of Stu Barr and Craig Bond from Good Nature – these guys have designed a possum trap which is more effective than existing traps, and much more humane too. I should mention that possums are an introduced pest and a huge threat to New Zealand’s native birds and plant life. Their trap technology continues to be adapted to different types of pests around the world. The best thing though are their crazy stories from product testing in the bush. When did you get that adorable dog? Walnut just celebrated his first birthday – with a big bone, a pig ear and a party with two of his brothers. We got him when he was a seven week old puppy, a little featureless sausage, the color of walnut wood. He has now fully grown into a scruffy dog full of character. And he travels in your backpack on your way to work? Yes, always. I hope he enjoys it as much as I do. In any case, this seems to be a very dog-friendly place… not like most big cities elsewhere. Is there any other city you could imagine yourself moving to in the future? In 2010 I spent several months in New York with my partner while she interned at the UN. Having thought I was done with big cities, I was pleasantly surprised to be seduced by one again. I’d happily spend some more time there as we made some great friends in this city. Like Achilles Kallergis – our old room mate, jazz musician, New School academic and the greatest Greek you’ll ever meet. He’d be a good candidate for a FvF-feature in the future! Now back to your design: When I look around your office, it seems like you design pretty much every object imaginable. From lamps to cutlery, from beer taps to bikes… how would you describe what you do professionally? I describe myself as being a product and furniture designer, but when designing products I do so with a furniture sensitivity. This means objects are designed from the inside out, starting with an understanding of the insides, there is no skin to an object, nothing is hidden, everything is exposed in its right place, celebrated. Are there any standout designs you have produced that continue to resonate with you? There’s always the honeymoon period for any new design. At the moment it’s this new meeting-dining table in the office that I’m particularly fond of. But aside from this current fascination, I can say I am fond of most of my designs. I listened to an interview with Thom Yorke once where he talked about hearing an old Radiohead song and he felt he barely recognized his own voice. Whilst I don’t share this lack of recognition in my own older creations, I do sometimes look back at them and think “Where did that idea come from?” or “What was going through my mind at the time to think to resolve it like that?” This is the mysterious side of design I love. Thank you Jamie and Walnut for spending a great day with us. Discover Jamie’s expansive design work here and find more stories in Auckland, here. We’ve dedicated an individual section to creatives’ studios and offices from around the world. Delve deeper into FvF Workplaces. This portrait is part of our ongoing series with Vitra. Visit Vitra Magazine to find out more about Jamie’s design pieces and other individual interior concepts.